I don’t remember how old I was the first time I read one of Anne McCaffrey’s Pern novels, but I was definitely no older than fourteen. I do remember that I’d confused DragonSong, which I loved, with Lizard Music, which I hated, for the longest time, and that probably kept me from reading them at first. 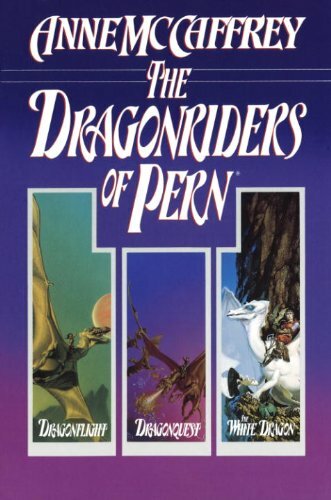 I have fond memories of a chilly night in a rented vacation home in Inverness, California, sleeping on a bunk overlooking the forest and the ocean beyond, reading long past the time I should have been asleep, because the house was strange, and too quiet, and the bookshelves held first editions of ALL of the Pern books. Later, of course, much later, I stumbled into the world of MUSHes and MOOs and found myself playing a dragonrider on a Pern-themed role-playing game. I met Fuzzy that way, and many of my other friends. Even later than that, I learned about McCaffrey’s incredibly odd views on homosexuality (which I will not go into here), and finally, I realized I’d grown out of Pern, though never out of science fiction. When I heard, a few hours ago, that she’d passed away yesterday at her adopted home in Ireland (a self-designed house named Dragonhold – Underhill), it affected me enough that I had to pause a moment, and take a breath, and send her love and light as her spirit is consigned to whatever eternity may be. I never knew the woman. But I knew her stories, and I knew her books, and they gave me hours of pleasure and led me to the man I love, and some amazing friends who are among the most talented people I know. And I know that she was the first woman to win a HUGO award, that she was one of the few women who was active and successful in Science Fiction/Fantasy when it was still very much a male-dominated genre, and that she served as a writing mentor to a collection of authors who went on to write amazing stories of their own. 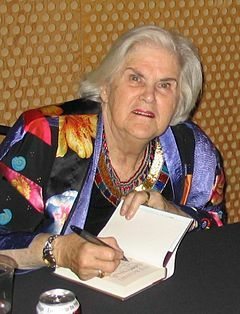 So, rest in peace, Anne McCaffrey. Maybe this weekend I’ll read one of your books as a form of remembrance. Ms. McCaffrey’s publisher has posted a statement about her death. You can see it here.